Mel Chin, Funk and Wag A - Z, 2012. Credit: Michael Stravato. Mel Chin, Safehouse, 2008. Image courtesy of the artist. Rick Lowe, Project Row Houses. Credit: Project Row Houses. Mel Chin and Rick Lowe explore the complexities of building healthy communities through art and activism. Projects by Mel Chin and Rick Lowe reveal the contributions artists can make to urban revitalization. The artists work with MIT students in the Department of Urban Studies and Planning (DUSP), the Community Innovators Lab (CoLab) and the MIT Program in Art, Culture and Technology (ACT) on a project that demonstrates the importance of cross-disciplinary intervention into planning and development practice. Students are given a rare opportunity to participate in art-making with these renowned artists in an experimental setting. Both artists are expert conveners and thinkers in this realm. Mel Chin’s recent work, Fundred Dollar Bill Project, is a nationwide initiative to support the recovery of lead-contaminated soil in post-Katrina New Orleans. Rick Lowe’s Project Row Houses in Houston, Texas, has been an outstanding and evolving model of community revitalization through public artwork since 1993. Presented by the MIT Center for Art, Science & Technology (CAST) and the Community Innovators Lab. Rick Lowe is the founder of Project Row Houses, an arts and cultural community located in a historically significant and culturally charged neighborhood of Houston, Texas. More at the artist’s website: Mel Chin. More at the artist’s website: Project Row Houses and Rick Lowe. MIT Visiting Artists Mel Chin and Rick Lowe present individual projects that engage art in planning diverse and lively urban environments. Active in their own communities and in national initiatives, each deploys art to reinvent locations in need of revitalization. Moderated by Dayna Cunningham, Executive Director of the Community Innovators Lab, a center of planning and development within the MIT Department of Urban Studies and Planning, the discussion examines the potential contributions of artists to an urban studies and planning curriculum. Mel Chin at MIT. Credit: L. Barry Hetherington. Mel Chin, Safe House, 2008. Rick Lowe, Project Row Houses, Houston, Texas, 2003. Credit: Danielle Miles. 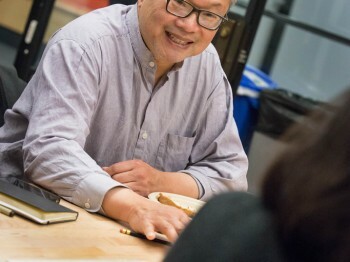 Visiting Artists Mel Chin and Rick Lowe work with ACT faculty and students on a project that demonstrates the importance of cross-disciplinary intervention into planning and development practice. Credit: L. Barry Hetherington. Mel Chin, Funk and Wag A – Z, 2012. Credit: Michael Stravato. Mel Chin and Rick Lowe at MIT. Credit: L. Barry Hetherington.